I have used up three perfumes this month, all of which were not full - they had about 1/3 left in each bottle so it didn't take long to use them up. 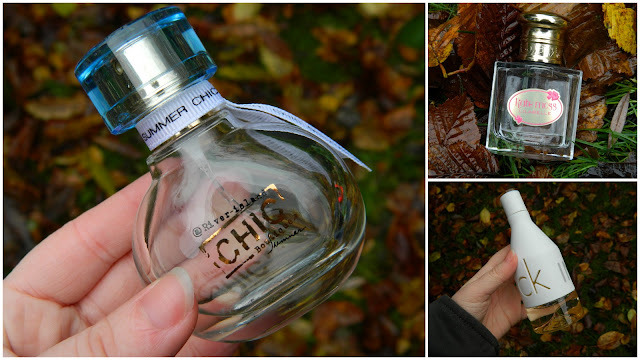 I have already posted a full review on this blog for the Kate Moss Lilabelle perfume - link here. The bottle/packaging in my opinion looks really quite unique, it reminds me of the glass beakers I used during A level chemistry/biology which isn’t really what I would expect from a perfume designer. The packaging/bottle in my opinion looks really cheap and tacky and I definitely do not like the packaging of this product. Also as the bottle is covered with white plastic you cannot see the level of how much perfume you have left. And the bottle itself is really quite heavy (not great for travelling) which means that you cannot judge how much perfume you have by weight. swimming pool’ about it but it does change into a great scent very, very quickly. simple but it is does look cheap, in my opinion. This fragrance as it was made my Riverisland it didn’t state the notes that go into the composition of this scent but overall I find that this scent is a strong floral scent which is really quite generic and it has some fairly strong musky notes too which doesn’t seem appropriate for a summery fragrance, in my opinion. The initial scent of this fragrance is very, very strong and I like really strong perfumes but this is too strong and it smell a lot like hairspray and cleaning products for the first few minutes. Overall, a generic scent with a lot of hairspray thrown in and the longevity on my skin is very poor and the longevity on clothing is also poor. 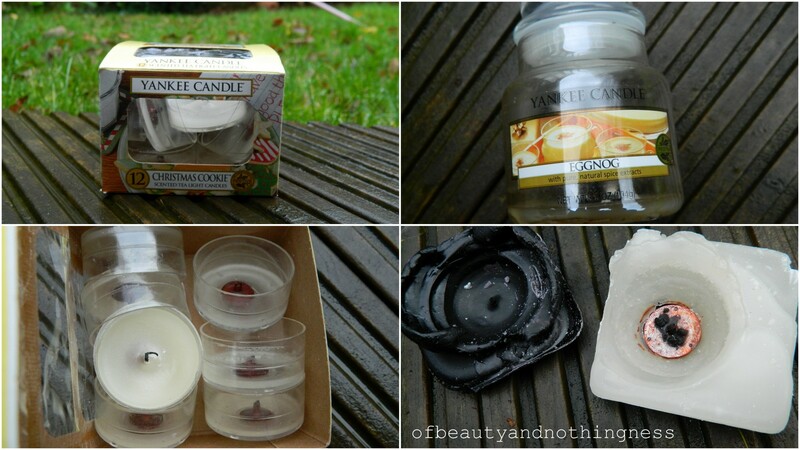 Firstly some yankee candles that I have used up, starting with a whole box of the Yankee Candle Christmas Cookie Tea Lights. I really like this scent, I have used up a small jar of this candle in the past and I have now used up this box - and I have another box waiting to be used! The scent isn't as strong as a jar candle would be but the scent strength overall is fairly good for tea lights - but not as strong as I would like the scent to be. The tea lights smell like cookies and baking and vanilla...gorgeous but I do wish the scent strength and scent dispersion/throw were better. Next up is a Yankee Candle Small Jar in the scent 'Eggnog' which may not be available now as I did buy this last year and I have only just worked my way round to using it. I really like the scent of this candles, it is creamy, boozy and spicy although it can be a bit too spicy (clove/cinnamon) after a while. I also have the tea lights for this 'Eggnog' scent and after they have been used up I don't think I would buy this scent again but it is a nice change. The next two Yankee Candles are samplers. The first sampler is one that i used up around Halloween but I have forgot about and it is the sampler in the scent 'Witches Brew' which is a Halloween special but it is still available on eBay. The scent before it started burning was horrible in my opinion but when it started burning and melting...it smells almost exactly like the Lush Glogg Christmas Shower Gel! Overall, a gorgeous sampler that I seriously underestimated and I will buy it again. The last Yankee Candle empty is a sampler in the scent Mistletoe and Fig which sounded really nice and in the packaging is does smell quite nice but it is hardly noticeable when burning/melting; it is almost unscented, in my opinion and it just smells like potpourri when you can eventually smell it. Overall, a mixed bag of Yankee Candle empties. 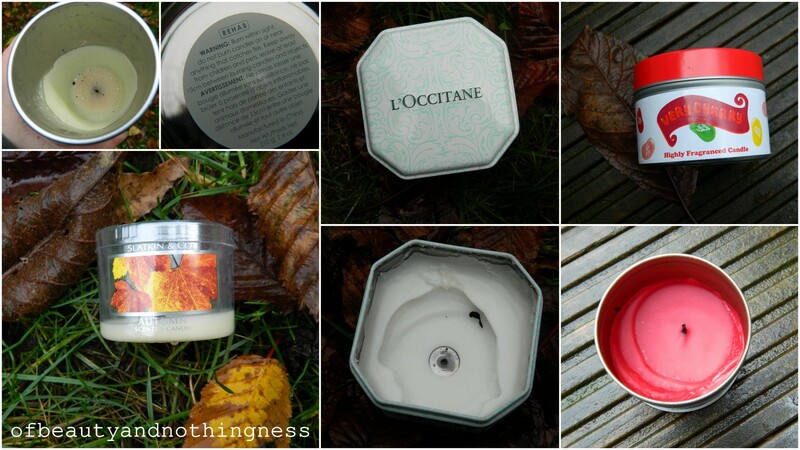 The next four candles are a mix from Rodial, Bath & Body Works, L'Occitane and Jelly Belly! Firstly, Rodial Rehab Candle which I bought from Debenhams a while ago and it was only £10, reduced from £35! A great bargain, in my opinion, at the time but this candle turned out to be one of the most disappointing candles I have used in a long time! The scent of the candle was just milk, almonds and overall the scent was disappointing. The scent strength and dispersion/throw were just as disappointing and I wouldn't buy this candle again and I do not recommend it! Next up is the Bath and Body Works in the scent 'Autumn'. Bath and Body Works products are not widely available in the UK which is awful! I really liked this mini candle, it smells like crisp fresh apples - it is quite autumnal and just gorgeous, in my opinion. Overall, the candle smells so nice, it has a good scent strength/dispersion and the candle burns/melts so evenly. I have been able to buy Bath and Body Works products from the UK website - www.bathandbodyshop.co.uk. The next candle is also quite disappointing and it is from L'Occitane unfortunately. This candle is the L'Occitane Green Tea Tin Candle. This candle isn't available anymore, as far as I am aware and that is no bad thing. I love L'Occitane and I love the scent of this candle, it is so fresh, calming and relaxing but as you can see from the photograph above - it does not burn evenly at all and a lot of the candle ends up being wasted! The last candle is the Jelly Belly Tin Candle in the scent 'Very Cherry'. Firstly, this candle has a strong scent, the packaging is great, neat and the candle burns/melts evenly so no wax is wasted. The scent though is the only negative point about this candle - the scent is very strong, very artificial and really quite sickly and horrible - I would recommend the brand but not the scent. I will have to try another scent as the formula for these candles is fantastic, in my opinion. balance me face moisturiser, Balance me skin care, beauty, caudalie cleaning water, caudalie uk, decleor aroma cleanse lotion, decleor kit, vichy micellar calming solution. Carrying on with my large collection of products that I have used up in the month of November, now it is on to skincare! Firstly, is the Balance Me Balancing Face Moisturiser which was a free sample I think (I have so many skincare samples it is unbelievable!). This moisturiser isn't really aimed at my skin type as this product is for normal to combination skin whereas my skin type is normal to dry and sensitive in areas. However this product worked really quite well, it has a almost gel like consistency which makes it really nice and smooth when applied. The moisturiser itself isn't as moisturising as I needed it to be so I had to use two thin layers of this product for my skin to be moisturised enough. Overall, a nice product that didn't irritate my skin but it just isn't moisturising enough for me - and it doesn't smell nice in my opinion - it has a very strong lemon candy/sweets scent which could be mistaken for cleaning fluid! 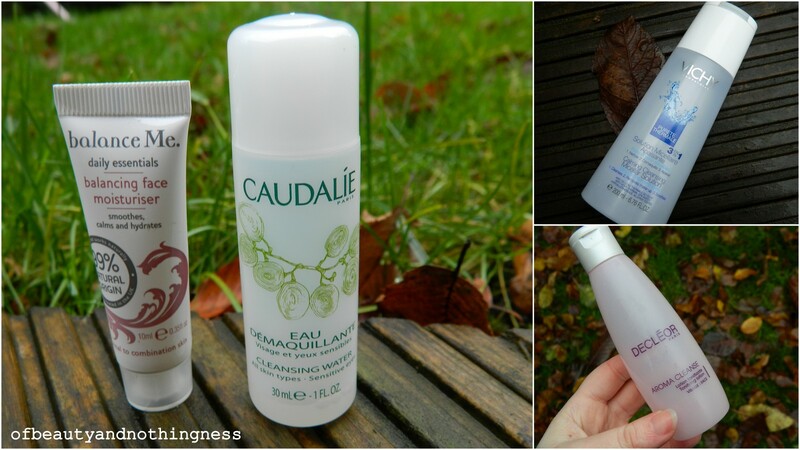 The next couple of products I have used up are two toners from two gorgeous french brands. Firstly, the Caudalie Cleansing Water which I have been using as a toner and it works really well as a toner, in my opinion. Although the first time I used this product I did experience a small amount of irritation which I haven't experienced with any other Caudalie product before. Overall, a nice toner and it is scented but after the initial minor irritation there wasn't any afterwards. Another toner I have used up is my Decleor Aroma Cleanse Tonifying Lotion. Firstly, I have no idea why this product is described as a 'lotion' as it is not a lotion at all - it is a normal watery toner! 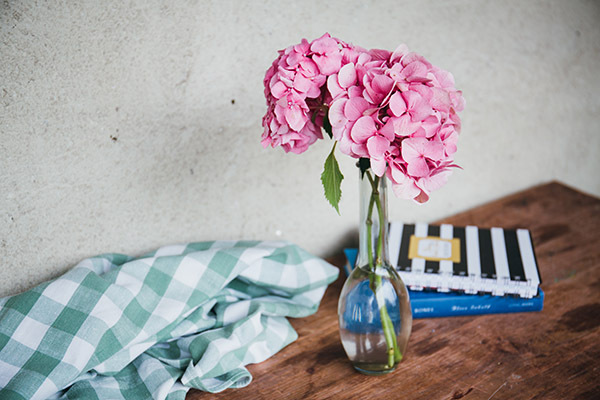 The toner works well with my skin although it is heavily scented - it smells very floral and even though it is scented it didn't irritate my skin. Overall, a really nice toner but it is not worth the money in my opinion - my Lush Eau Roma Water works just as well and it is so much cheaper. The last skincare product I have used up this month is the Vichy 3 in 1 Calming Cleansing Solution which is one of the best makeup removers I have ever used - it is just as good as my Bioderma! Quite a few makeup removers I have used have either made my skin really dry/tight or they have left a greasy film on my skin but this doesn't do either of those things - this makeup remover removes all of my makeup effortlessly and leaves it feeling like skin. Overall, a fantastic product that doesn't irritate my skin, make it greasy or make it dry/tight and it is great for eyes and face. 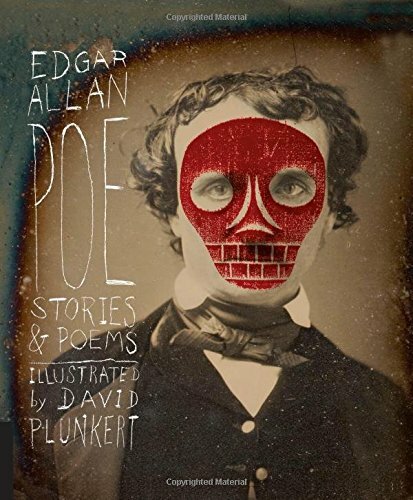 Highly, highly recommended. I have been watching beauty gurus empties videos on youtube and they usually have quite a few empties but I always end up with loads of empties and this month there have been so many empties overall, from candles and bath products to perfume, haircare and some skincare items too. Firstly, Dove Colour Radiance Express Treatment Conditioner (50ml) which I received as a free sample with an online order. I have been using this for the past week as these 50ml samples of haircare products don't last long with me as I use a lot of conditioner. The conditioner is in part...pink! The fact that this product is a mix of pink and white makes me like this product initially and the product overall is really good. The conditioner smells nice, it conditions my hair fairly well and it doesn't weigh my hair down - but this product can make my hair look and feel really greasy if I don't wash it out really well. Another conditioner I have used up is the Fudge Wet Head Conditioner which I bought from the 'when its gone, its gone' section of Boots.com a while ago and it was less than £5 for a large 500ml bottle which I think is fantastic value. Unfortunately this is where the positives points about this product ends. The conditioner smells horrible - like plastic and playdoh and the conditioner has a really strange gloopy slimy texture. Overall, it conditions my hair fairly well, it smells horrible, it has a horrible texture/consistency and it is not very widely available - which isn't a bad thing, in my opinion. Next up are a few shampoos that I have used up in the month of November and again it doesn't take me long to use up shampoos so I always have a few empty bottles of shampoo each month. Firstly, is the Avon Natural Volumising Raspberry and Hibiscus Shampoo. I bought this shampoo purely because it was 99p a couple of months ago and I am really disappointed with this product - it smells ok, it lathers fairly well and it was cheap but they are the only main positives for this shampoo. The shampoo didn't volumise my hair at all and overall it was just an average cheap shampoo. The next shampoo is the Goldwell Ultra Volume Gel Shampoo which I received as part of a minis set (free gift) with a www.cheapsmells.co.uk order a while ago. I do not get along with volume shampoos at all as none of them help with volume! This product feels quite strange to use as it is a gel and it initially difficult to lather because the gel is so thick in the hair but eventually it lather but not very well. Overall, the shampoo is average and it doesn't deliver on its volumising claims. Lastly, a hair oil and I do like the idea of hair oils and I know they are raved out endlessly but I don't like the way they feel in my hair. This is the Osmo Berber Hair Oil and is the nicest hair oil I have used; it smells gorgeous - like strawberry sweets/candy and it is really cheap but I did get this hair oil with a beauty box. The oil does help tame frizz and it smoothes my hair but I personally just don't like the way this feels in my hair. 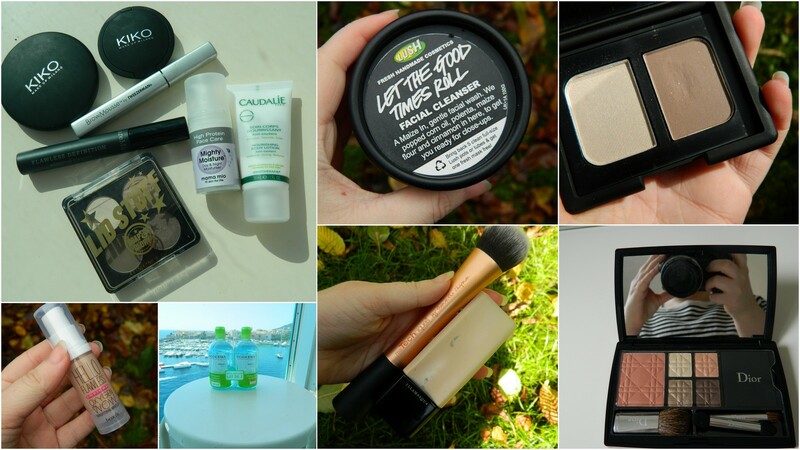 Avene, beauty, beauty brands england, beauty brands italy, benefit, diorshow waterproof review, GHD opulence hair mask, illamasqua light foundation 120, kiko cosmetics uk, tweezerman browmousse. 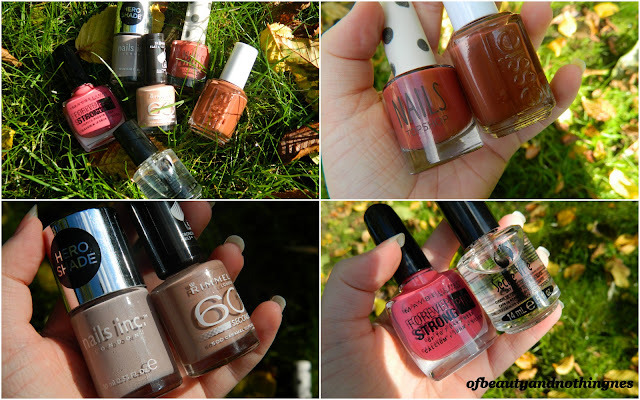 A-Z Of My Favourite Beauty Brands! A is for: Avene - one of the first french skincare brands I tried and I find their gentle cleanser to be amazing when my eczema breaks out! 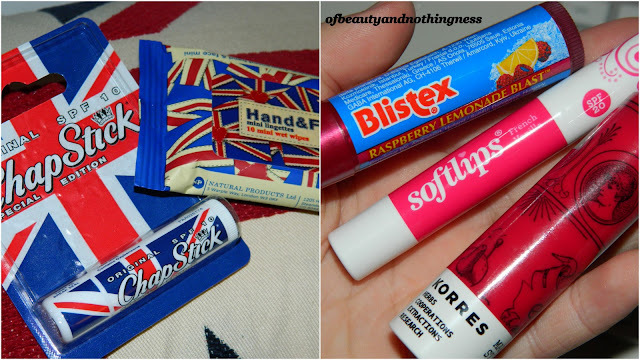 B is for: Benefit and Bourjois - great foundations, nice packaging, widely available. C is for: Caudalie! I adore Caudalie as none of their skincare products irritate my skin. I also love the brand Clarisonic and I do love my Clarisonic Mia. D is for: Dior! I have been hooked on Dior since I bought my first Dior Mascara (Diorshow waterproof) and I have since bought a couple of large Dior travel exclusive palettes. Also Dove has to be included here as it is one of my favourite body/bath brands. 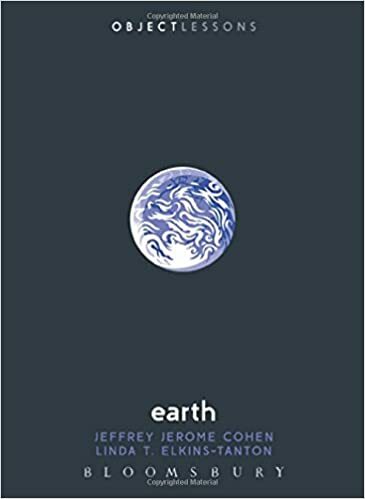 E is for: Eucerin - I love their 10% urea lotion for when my skin gets flaky and very dry and of course I have to metion ELF here as they make some great, cheap makeup although there are some awful products too. 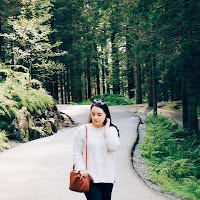 G is for: GHD - I have a pair of GHD straighteners which I used to use a lot but I prefer to embrace the curls, although they are the best straighteners I have used and the GHD Opulence Hair Mask is fantastic. I is for: Illamasqua - a great brand that produces high quality (and slightly quirky) products; I love the Illamasqua Light Liquid Foundation in the shade LF120 which is the only match for my paler than paler skin right now! K is for: Kiko, since I spent 40 euros in one Kiko store (in about ten minutes) I have been addicted to the brand Kiko - it is an Italian brand but they do ship to the UK - I love their lip pencils, eye shadows, nail polish etc. M is for: MAC, I have quite a few things from MAC on my beauty wish list and I only have few things from MAC but I love my MAC Moisture Cover Concealer (shade NW15). N is for: Nars; I love my Nars Velvet Lip Pencil in the shade Dolce Vita, my Nars Pro-Prime Eyelid Primer, my Nars Bellissima Eyeshadow Duo and my Nars Bronzer in the shade, you guessed it, Laguna! 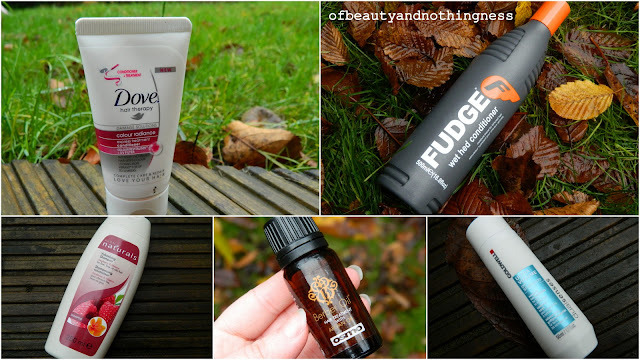 O is for: Original Source - they make great (and great smelling) shower gels that are so cheap! P is for: Prada, in particular their Prada Infusion D'Iris which is my joint favourite perfume of all time - along with L'Occitane Cherry Blossom. R is for: Rimmel, the essential brand for secondary school girls - all of my friends had Rimmel makeup while at secondary school and I still use some of their products now such as the Stay Matte Powder. V is for: Vichy - the Vichy 3 in 1 Calming Cleansing Micellar Solution - it is just as amazing as Bioderma, in my opinion. W is for: Wella - in particular their Clear Scalp Mask which is the only product I have used that gets rid of dandruff completely! Y is for: Yves Rocher; they make gorgeous bath, body and fragrance products! Although I wish the products were more available in the UK. I also love my YSL Parisienne perfume. I remember as a child being obsessed with the Clarie's Accessorises goody bag which was about £5 and it contained a range of unknown products - this is the adult beauty version! I was really excited about this product and when I saw it on the Selfridges website I ordered one almost immediately. The lucky bag contains at least five beauty must haves and it is priced at £15 (£4.95 UK delivery). The delivery time for Selfridges is great from my experience; although I think the delivery price is too high! 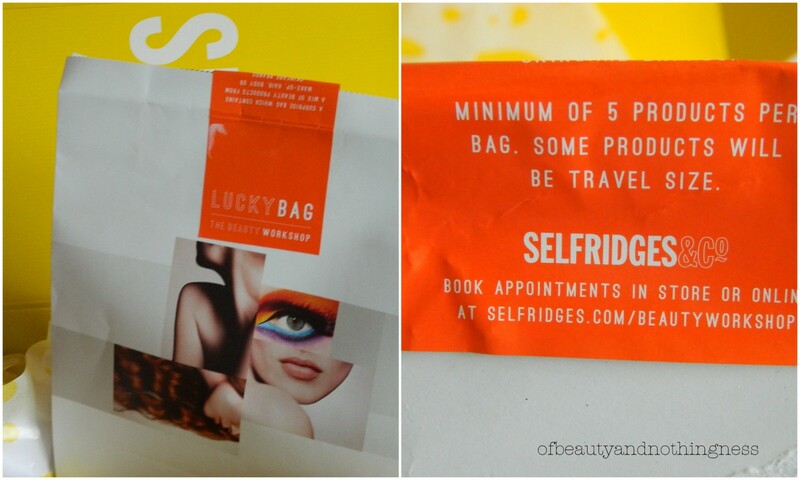 The first item that was in my Selfridges lucky bag is: Inner Me Lustrous Locks Vitamin Complex (RRP: £15, 28 tablets). I have a problem with swallowing tablets of any kind and I have tried one of these and I don't like them - I hate tablets. So I will not be using these and if anyone wants to buy them you can email me at: heathernixon4@hotmail.co.uk. The other items I received include: St. Tropez Everyday Body Moisturiser, Medium to Dark (50ml travel size, RRP £10-14). I have another bottle of this that I am not using because it is too dark for my pale skin (I received the first bottle with Elle magazine). So this lucky bag is looking very disappointing with two products now that I cannot use! The other two items in my bag include a pack of tissue and a duck lip balm - a £15 bag and they give me tissues and a duck lip balm! The duck lip balm is ridiculous as the actual balm is in the ducks...arse, and you cannot get to the lip balm without using a lip balm or cotton bud. The last two items in my bag where a bit better than the awful products before. Firstly, a Blink Gift Card for an Eyebrow Shape which sounds great but there is no indication as to how much the gift card is worth! The last products is the only product I was excited about and it is the Dermalogica Daily Microfoliant (£20-38) which sounds great and I am looking forward to using it. 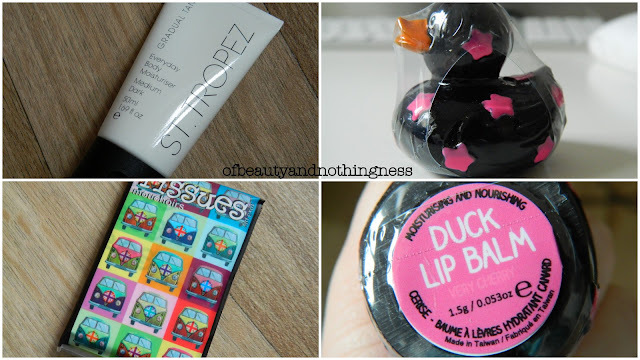 Overall, I love the idea of a beauty lucky bag but I am disappointed with this bag as there are only two products that I like - and I cannot believe that they included a pack of tissues and a ridiculous duck lip balm in the bag! 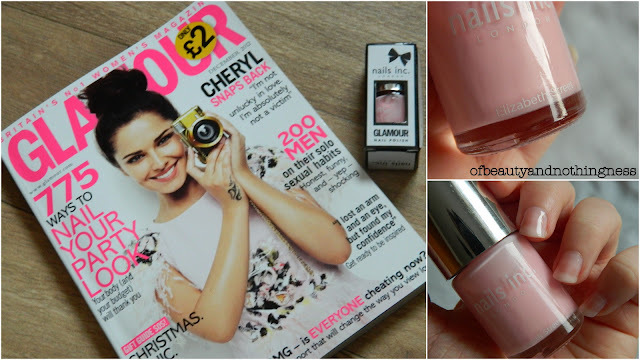 The first magaine I bought this month is Glamour UK which contains four free Nails Inc polishes (10ml) each which is full size! I bought the pale pink shade called 'Elizabeth Street'. I tried this polish today and it did look streaky as it was applied and after it had dried it was a little bit streak. Also with just one coat it was really sheer and I could clearly see my nails through the polish - a bit disappointing. The second magazine is Marie Claire Uk which isn't a magazine I buy normally unless there is a a good freebie in it - like this month. This months Marie Claire freebie is the Jemma Kidd Instant Lift Skin Perfecting Primer which I haven't tried yet but it looks good. The last magazine is Elle UK which I didn't buy for the freebie as I do not shop at Dune but the freebie is a £20 gift card for Dune - but on boots only. Not a freebie I will use but I always buy Elle magazine. I have been loving the recent bargains online over the past three or so weeks; so naturally I had to get some of the deals on offer! Some are from Debenhams, Cheapsmells.co.uk, Urban Outfitters, Superdrug, Topshop and latestinbeauty.co.uk. I found an amazing offer on Debenhams (which isn't running now unfortunately) where: if you bought anything from Rodial you would automatically get a FREE FULL SIZE DRAGONS BLOOD EYE GEL! how could I pass on this amazing offer, especially as I have been wanting to try the Rodial Dragons Blood range for a while now. 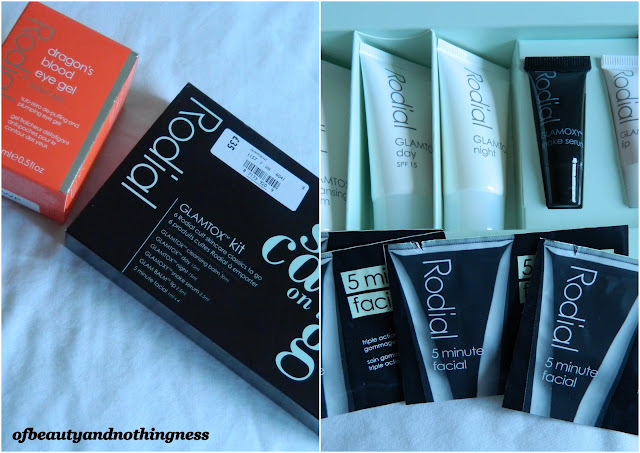 I bought a set of mini Rodial products in order to get the eye gel which should have been around £40 on its own! The set is labelled at £35 but I only paid £20 which was great! A few other little bargains where from Urban outfitters (photograph on the left). Urban Outfitters are having a sale on now and I bought a couple of patriotic items (I am not very patriotic though but they look great). I bought a pack of hand wipes (very interesting I know!) which are cherry scented and they where only £1.50. The limited edition chapstick was also only £1.50 (free delivery too). I also bought a couple of new lip balms (because I need more to add to my collection...) I bought the new raspberry lemonade blistex lip balm, a softlips french vanilla lip balm and I finally bought a Korres Lip Butter Stick in the shade 'rose'.